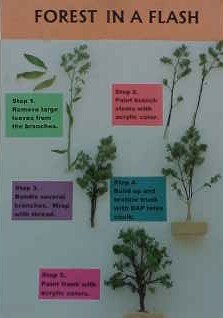 Fast and easy to assemble kits include beautiful plant material with thousands of tiny natural "leaves". Fully preserved and dyed in a wide range of natural looking colors. Available in a variety of summer greens as well as fall colors. Oaks, elms, aspens, cottonwoods and many other tree types can be made. Each kit will make between 6 and 20 trees depending on the sizes you choose to make.